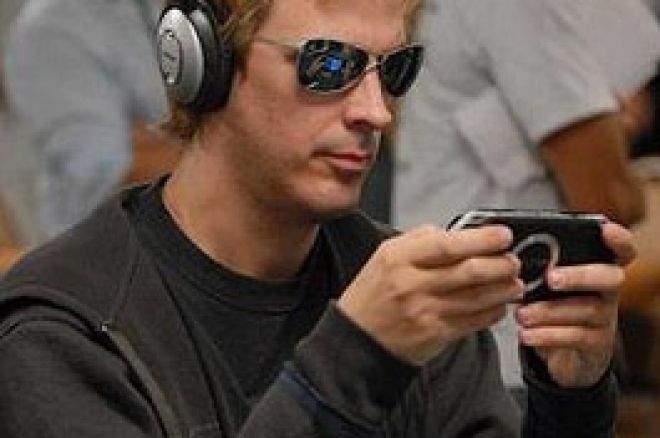 Poker professionals Phil Laak and Ali Eslami have defeated a poker-playing computer program dubbed Polaris in the "First Man-Machine Poker Championship." The two-day, four-session match took place at the annual meeting of the Association for the Advancement of Artificial Intelligence in Vancouver, Canada. Polaris finished ahead of the human team in both of the Monday sessions, although the margin of victory in the first session was small enough to be determined a "statistical tie." On Tuesday, however, Laak and Eslami were able to defeat Polaris in both sessions. Polaris was developed by the University of Alberta's Computer Poker Research Group (CPRG). The group is led by Jonathan Schaeffer, chair of the U. of Alberta's Department of Computing Science. I had the opportunity to speak with Prof. Schaeffer late Tuesday afternoon, just as the third session was drawing to a close. I asked Schaeffer what the outcome of the match would signify to the CPRG. "If we lose, we lick our wounds and go back to the drawing board to try to develop new and better technology," answered Schaeffer. "If we win, we analyze the matches to better understand what happened." He added that even if Polaris were to defeat Laak and Eslami, "these are a small number of hands played under conditions not necessarily favorable to the humans." He explained that given different circumstances he was certain that some players might well perform more effectively against the program. I mentioned to Schaeffer recent controversies involving online poker and the use of "poker bots." "I want to be clear," he said. "We do not play online poker. None of our software is enabled to play online poker on any of the sites." He also noted that none of the Poker Academy software that incorporates some of his group's research is designed to play online, either. Rather — as is explained on the match website — games "are an excellent domain for artificial intelligence (AI) research because games have well defined rules and clear goals." Because poker "contains uncertainty," it poses an especially "interesting research challenge." For the same reason, poker is an especially fruitful game to study, since uncertainty is "also prevalent in real-world problems for which AI techniques are being sought." Each session consisted of 500 hands of "duplicate" limit Hold'em, with $5/$10 blinds and $10/$20 limits. The first session began just after noon on Monday, July 23rd. Eslami took on Polaris before a live audience, his game projected onto a widescreen for all to see. Meanwhile, Laak played in a private room elsewhere in the Hyatt Regency Hotel. The cards Eslami received in the public room were the same cards dealt to Polaris upstairs, while Polaris' cards in the public room were the same dealt to Laak in the private room. The community cards were also identical. Eslami's initial encounter with Polaris was an up-and-down affair. Near the midpoint of his session, Eslami was over $800 ahead of the computer, then saw his entire lead evaporate over the course of the next hundred hands. A final upswing enabled Eslami to finish $395 ahead. Meanwhile, Laak suffered a miserable start against Polaris, finding himself down more than $1,500 before they had even played 200 hands. Interestingly, a comparison of the two players' matches shows that with the same combinations of cards Eslami had only built half the lead Polaris did during that early part of the session. Laak mounted a late comeback and managed to finish just $465 down by the end of the 500 hands. When the two sessions were added together, Polaris ended with a $70 edge over the humans — seven small bets. It had been determined beforehand that a team would need to finish with an advantage of 25 small bets ($250) or greater to earn a victory, otherwise the match would be declared a statistical tie. Laak and Eslami split a $2,500 prize for earning the draw in the first session. Score: Laak-Eslami 0, Polaris 0, with one draw. Monday's evening session saw Laak take the seat in the public room while Eslami headed upstairs. The second session drew a large crowd, with over a hundred spectators (including Laak's girlfriend, Jennifer Tilly) watching Laak play and being entertained by his occasional "Polaris is sick" comments. Laak started strong, building a lead over Polaris that he maintained throughout the match. In Hand No. 198, Laak was dealt in the big blind while Polaris held . Polaris raised and Laak called, and the flop came . Both Laak and Polaris checked. The turn was the and Laak bet out, only to be raised by Polaris. Laak called. The river was the , and Laak check-called Polaris to take down the $80 pot. Laak continued steadily to build his lead, ending $1,560 to the good. However, Eslami hadn't fared as well, with Polaris having taken $2,515 from him using the same cards Laak had been dealt. For example, in that same Hand No. 198, Polaris picked up extra bets preflop (where the computer raised with ), the flop (where Polaris bet out), and the river (with a check-raise). The dominating 95.5 small bet advantage meant victory for Polaris in session No. 2. Score: Polaris 1, Laak-Eslami 0, with one draw. Laak and Eslami were given hand logs to study before coming back Tuesday for the final two sessions. Laak — in the public room for the third session — was essentially even with Polaris after 250 hands, holding a mere $30 advantage. A rush of cards thereafter enabled Laak to build a $1,800 lead through 425 hands. He finished the session $1,415 ahead, and there was some suspense as Laak and the audience awaited news regarding Eslami's duplicate session. During the wait it was determined that a brief glitch during play upstairs meant one hand had to be thrown out, adding another $40 to Laak's total. Finally Eslami returned and it was reported he'd only lost $635 to Polaris, meaning the human team had cumulatively finished $820 — 82 small bets — ahead of the program to take the third session and the $5,000 prize that went with winning. Score: Polaris 1, Laak-Eslami 1, with one draw. Laak and Eslami's win added extra drama to the final session Tuesday evening, as its outcome would now determine the overall winner. After a dinner break and a prematch strategy session, the players returned to battle Polaris one last time. "This is so intense," said Laak. "I've never had a huddle session before a poker match before." Eslami returned to the public room and got off to a good start by turning trip nines to defeat Polaris's pair of jacks. A hundred hands later, however, Eslami had slipped to a $255 deficit. As the match progressed, Eslami explained to the audience some of his ideas about how the program was playing, as well as how exhausting it was to play against such a relentless opponent. Eslami would battle back to retake the lead around the 225-hand mark, eventually building a $895 advantage after 325 hands. He'd keep that lead to the end, finishing $460 ahead of Polaris. Laak soon returned from the private room to report that he'd also finished ahead of Polaris by $110, meaning the humans had together accumulated $570, or 57 small bets, more than their computer opponent. The pair netted another $5,000 for the second session victory. Final score: Laak-Eslami 2, Polaris 1, with one draw. Much as Schaeffer had earlier downplayed the relative significance of a single sample of 2,000 duplicate hands, Eslami likewise insisted afterwards "this was not a win." Indeed, over the 4,000 hands played, the humans ended with only a small ($365 or 36.5 small bets) cumulative advantage. Still, the match should give Schaeffer and the CPRG a great deal of new information with which to continue their research. Last week it was reported that after nearly two decades of study, he and fellow researchers had finally "solved" checkers, creating an essentially unbeatable program that always chose the best possible move. I asked Schaeffer if the CPRG similarly hoped to "solve" poker. "One of these days — within 5 to 10 years — two-person, limit Hold'em will be solved," Schaeffer told me. "We're going to keep working on this," he added. "Poker is fun." Live blogs from all four sessions can be found at the U. of Alberta website (cs.ualberta.ca), where complete hand histories also will be made available.